warning: this story may be one of those things that you had to be there for. 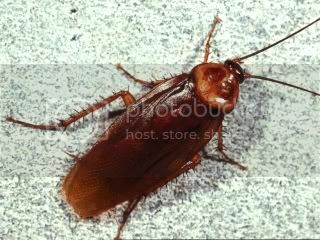 Last night John and I were talking when I saw one of these ugly things crawling up our wall. Now in the 9 years we've lived here, I can count on one hand how many times they've been in our house. And that would be too many times! The horrible roach. We did not grow up with these things and they creep us out! They make my skin crawl and they make my strong husband turn into a pansy. Well, I did what every wife does and claim that it's the husband's responsibility to get rid of the thing. After gaining courage he tries to find a magazine to hit it with. "No, not that one, I like it." And then that one is "too new to use." After he found the correct reading material he stealthily crept toward his vile enemy. That's when the big thing took flight! "What? Now they fly!" We tried to find it with no luck. We have ten foot ceilings that have a shelf that runs along the top of the wall. Thinking it had taken refuge in the plants on the shelf John went and got his wooden ladder. I kept imagining that as soon as he got up there the thing would fly into his hair. But I kept that information to myself because I'm always looking for entertainment. But we couldn't find it. I shut our bedroom door because I didn't want to worry about that thing landing on us as we slept and we went back to our conversation. A short time later Madison came out of her room because she didn't want to go to bed, I mean she needed a drink of water. As she headed back down the hall we heard a scream of horror come from her lungs. John and I looked at each other, "It's back!" Earlier that night John had piled all the kids shoes that had been left around the house in a pile in the hall. Methodically he grabbed a shoe on by one and hurled it at the creature. The next thing that happened was one of those things you wish you had caught on film so you can watch it over and over again. The beast came flying at John's head. John did a backwards summer sault. He then scurried across the floor on his hands and knees as fast as he could. All the while screaming like a girl. And I was rolling on the floor laughing so hard that I thought I would start labor. Now John was serious. This was war people. He was going to pull out the big guns. Oh yes my fellow warriors, he got out his air soft gun. 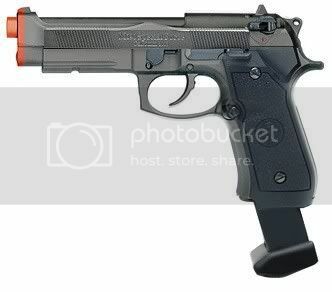 The kind of gun that shoots the little white BB's. I was rolling my eyes at how ridiculous this was but at the same time I kind of wanted to see how this would turn out. Madison and John tracked the creepy, crawly, flying thing into the bathroom. The bathroom was small enough that there isn't room for 3 people. Plus I didn't want to be trapped into that little space if the varmint took flight again. But I heard things like, "Madison look under that blanket." And "Madison, be strong and stick your head in there so you can see better." Suddenly there was the violent sound of rapid fire! "Boom Boom Boom Boom!" And then the sound of something hitting the floor over and over again. I could mention that there was also screaming again but I won't. Then Madison and John emerged victorious. They had defeated their enemy. That three inch thing had nothing on the two of them, the air soft gun, and a tupperware container. They won! They looked so pleased until I informed them that they couldn't leave the smashed thing sitting on the floor in the linen closet. So that took a lot of toilet paper and a lot of squirming and squealing until it was disposed of down the toilet. And just in case my brave husband John reads this blog in for the first time, I love you John. Thank you for protecting us from bugs. And just as you said you never know when those things can turn all "Men In Black" on you.